A dolphin performs poorly in a University of Florida land-based locomotion test. Even the dolphins' proven ability to navigate through a form of sonar called echolocation was ineffective on land. "The military has claimed great success in training these mammals, utilizing their echolocation skills to detect mines that have been placed underwater," said Lindell, who conducted a similar experiment in a concrete parking lot. "We were unable to replicate this finding ourselves." Lindell added: "In most cases, the dolphins succeeded in finding land mines only when we placed them directly on top of the mines." 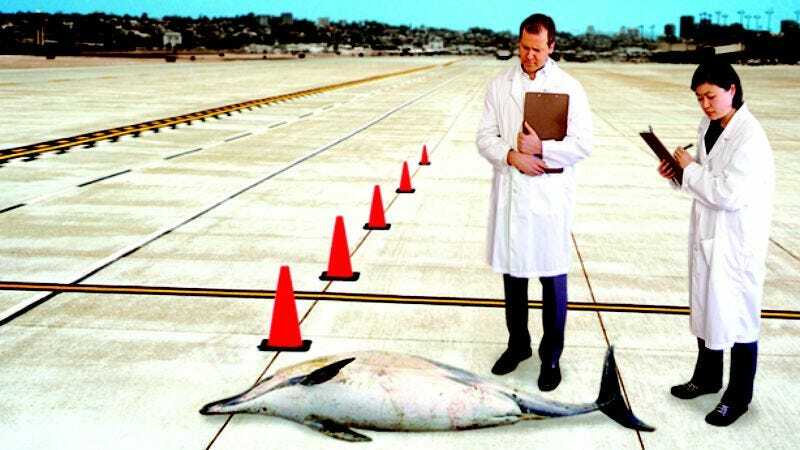 In another test, several pounds of mackerel were placed on the ground, separated from the test dolphins by only 20 feet of concrete. The dolphins were unable to reach the food and feed themselves. Despite their failures in the initial series of tests, the animals were given further opportunities to demonstrate their intelligence on land. The dolphins were unable to display novel behaviors, use a map to pinpoint their location on campus (spatial reasoning), or complete a simple obstacle course and wall climb. "Their learning curve was actually negative," Lindell said. "The more time we gave them to complete basic land-based tests, the more pitiful their efforts became, with many of them opting to bask in the sun rather than perform a simple task." "In some cases," Lindell added, "the dolphins appeared to be looking directly into our eyes, as if pleading with us to help them perform better in these tests." Many scientists believe these findings may help to explain why dolphins, for all their vaunted intelligence, have never developed technology or agriculture, or harnessed the power of fire—skills still exclusively in the domain of Homo sapiens. Said Lindell: "Their failure is a great disappointment to all of us who once felt an intelligence-based kinship with these majestic animals."